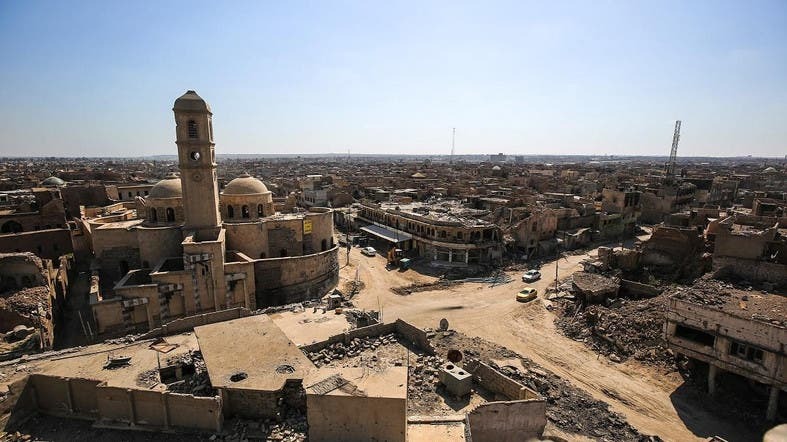 A picture taken on March 14, 2018 shows a view of destruction surrounding the Roman Catholic Church of Our Lady of the Hour (L) in the old city of Mosul, eight months after it was retaken by Iraqi government forces from the control of ISIS. (AFP). Thus spoke Chahd, the 19-year-old Iraqi citizen to Al Arabiya. Chahd was displaced with her parents and her brother, who is seven years younger than her from Al-Hamdaniya in Mosul to Baghdad. She witnessed a lot of violence because of the oppression of ISIS and the destruction of the city as a result of the war. The military war on ISIS is over, but extremist ideology is growing and poses the greatest threat to the lives of thousands of Iraqi Christians and religious and sectarian minorities. Between murder, displacement and kidnapping, hundreds of Christian families in Baghdad are living under constant anxiety. The thumb is still store after the assassination of Dr. Shatha and her family a few days ago in Baghdad. The deputy head of the Evangelical Church in Baghdad declined to give any statement about the dreams of Iraqi Christians living in the Iraqi capital to protect what is left of them in Mesopotamia. Nabil is a Christian merchant who was displaced after ISIS occupied Mosul and returned to it after its liberation. But he found that his house and his factory which he had inherited from his father, was a pile of ruin. But Nabil's suffering increased after he fled to Baghdad, and was surprised when he thought of opening his own project to support his family. Nabil recounted his continued suffering in Baghdad to Al Arabiya English, saying that after he opened his project, some gunmen came and asked him to pay the fee, as they put it, otherwise he could not continue to work. He refused to pay the money and filed a complaint with the security authorities. However, it was useless and things took a turn to the worse when they kidnapped his 5-year-old daughter, as a result he had to sell his car to pay the ransom and the fees for one year. Nabil said that these gunmen are walking in the steps of ISIS referring to their actions in the Nineveh plains, pointing out that he is now looking for asylum in one of the European countries to live his life freely and safely. As for Father Fadi Ragheed, he told Al Arabiya that “the churches of Iraq are in danger,” expressing his deep sorrow and pain at what is happening to the Christians, who constitute the infrastructure of Iraqi society. Father Fadi Ragheed said that after 2003, the situation worsened for the Christians and al-Qaeda was their biggest threat. After 2014, the threats increased and the Christians suffered from ISIS on the one hand, and the gunmen who demand the fees and extremists on the other. He concluded by saying that they will overcome the crisis and that security and stability will reign in Iraq.